In the business of real estate, where properties enter and exit the market quicker than it takes to stage a home, it can be a challenge for firms to keep their listings accurate and up-to-date. Online listings are one thing, but what about displaying listings at an in-person location? Even the largest, most successful firms struggle with this challenge, missing out on important opportunities to reach potential clients – and with the right information. Enter the story of how real estate franchise RE/MAX, an industry leader for over four decades, found the perfect solution in CrownTV’s digital signage technology. 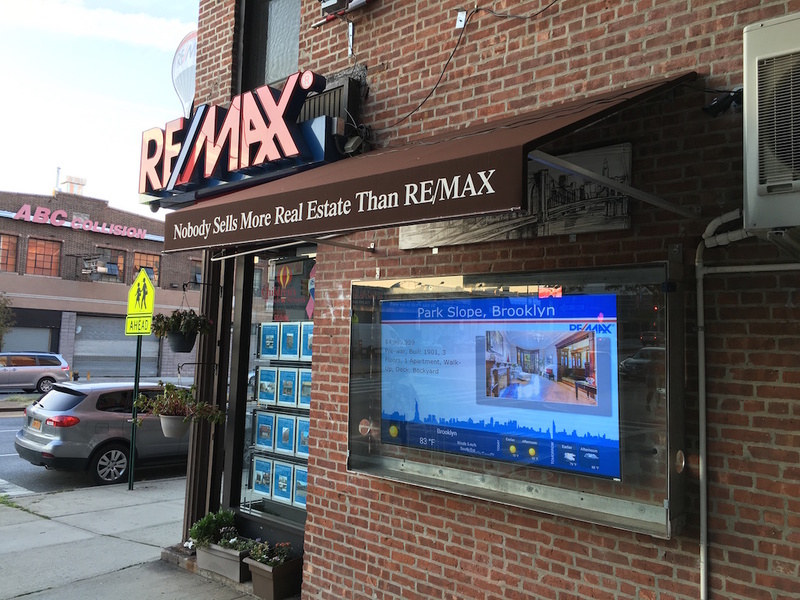 Not unlike some of CrownTV’s previous clients, RE/MAX’s office in Park Slope, Brooklyn had already been using digital signage but were seeking a better solution. Specifically, they had settled for a so-called “do-it-yourself (DIY)” digital signage method: mirroring content from Windows computers onto TV screens and monitors. The method was unreliable for several reasons, the top one being that it was difficult to control how content would appear on screens of varying resolutions. The picture quality was often poor, and content was sometimes cut off from the screen. 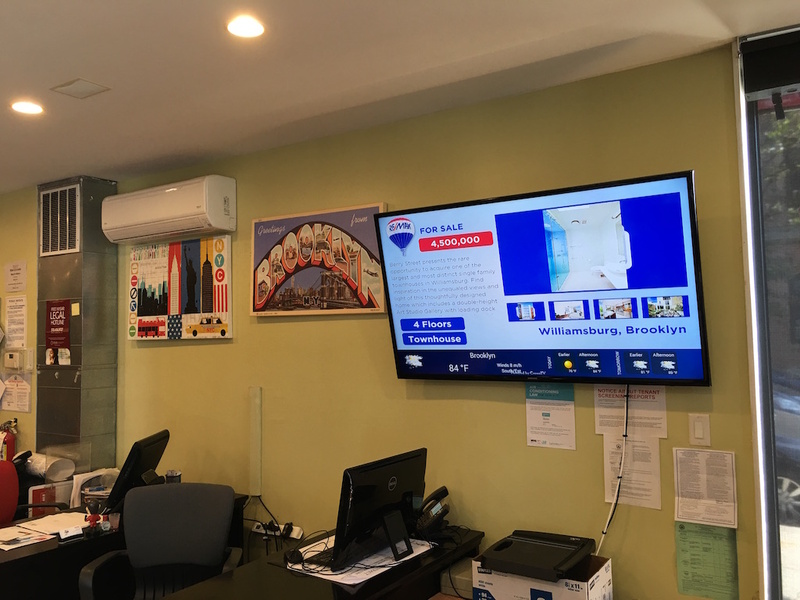 CrownTV took notice of these issues and stepped in, upgrading RE/MAX’s solution to one powered by our plug-and-play digital signage players and cloud-based dashboard. Because our technology is compatible with any digital display type or resolution – from TV screens to projectors to video walls – we were able to work with RE/MAX’s existing displays, one being in the office’s waiting area and two being in the storefront window. This was a major convenience, removing the entire step of choosing and installing displays from the setup process. The picture quality improved drastically, doing much more justice to RE/MAX’s property listing photos. Previously, in order to update their content, a RE/MAX employee had to log onto a certain computer within the office, connected to the screen they wished to update via HDMI cord. There was one computer per screen and no dashboard of any sort. Content couldn’t be updated remotely – it had to be done from within the RE/MAX office. CrownTV’s digital signage solution changed all of that, allowing users to control content from any internet-connected device, inside our outside of the office. The CrownTV dashboard is an all-in-one destination for RE/MAX’s content management, and only one login is required. There’s no more need for multiple computers connected to certain screens, and making sure all necessary content is stored on the proper computer. If they wish to, RE/MAX can create multiple logins, each with specific permissions chosen by an account administrator. In addition to RE/MAX’s operating experience now being much smoother, they’re also able to take advantage of previously unavailable opportunities to attract clients and sell properties. 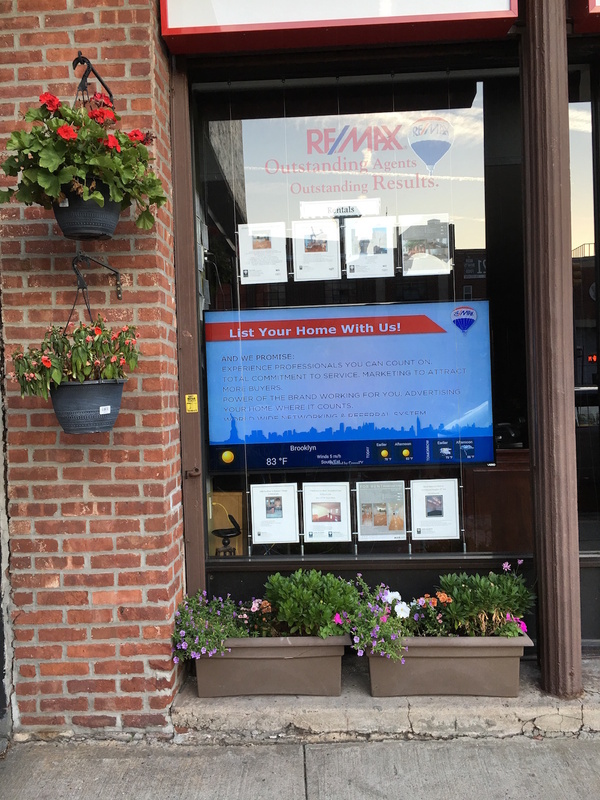 Due to the difficulties with their prior solution, RE/MAX weren’t advertising upcoming open houses on their storefront window screens. With CrownTV’s content scheduling feature, however, they can now program in open house promotions weeks before they occur and have them automatically display at certain dates and times. Passers-by who otherwise wouldn’t be aware of RE/MAX’s upcoming open houses may now see them advertised in the window, and possibly attend. “Our displays have been eye-catching, informative and have gotten great reviews,” said Christine Medina, RE/MAX’s Marketing Coordinator. Despite all of these features, CrownTV’s plug-and-play solution is easy to set up and requires no technical knowledge. RE/MAX’s favorite CrownTV feature – and a favorite of many of our clients – is our custom-branded listing templates. The templates were created by our team of designers specifically for RE/MAX according to their branding guide. All RE/MAX needs to do is input photos and text, and the listing is ready for display. They particularly appreciate this feature when it comes to their more luxurious properties for sale. “It does attract our more high-end clients. It shows that we do have ‘Million Dollar Listings’. People do stand and watch our displays,” Christine told us. The listings are functional as well as attractive, as RE/MAX can add, remove or edit them anytime, anywhere with just a few clicks in the dashboard. The status of real estate listings can change on a whim, and it’s important to keep them accurate and up-to-date for the sake of clients making one of life’s biggest purchase decisions. RE/MAX loves the flexibility of the templates and how much control they have over them. “Our favorite is our listing templates, where we are able to write a description of the home with multiple photos,” Christine said. And the templates aren’t just for listings. CrownTV also created branded templates for company announcements and an advertisement for listing a home with RE/MAX. These templates allow the solution to also function as an internal communications and business growth tool. In addition to listings, RE/MAX can mix in other content like social media, trivia, a Quote of the Day and the local weather. Such interactive content helps break up the monotony and make the screens both static and dynamic. Digital signage addresses many of the necessities of real estate firms, like keeping listings updated, showing numerous, high-quality photos of properties, and taking advantage of opportunities to reach potential clients. It’s much more practical to manage than paper signage in a business where accurate, up-to-date information is currency. The housing market may be challenging and unpredictable, but managing real estate signage doesn’t have to be. 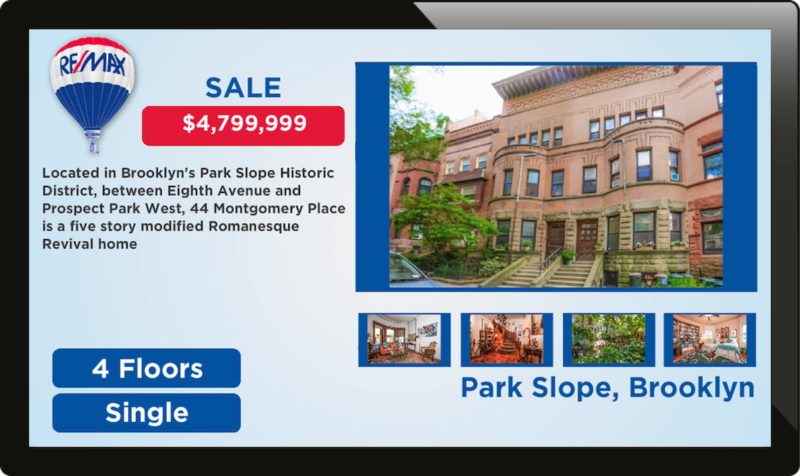 For more information on digital signage for real estate firms, request a demo today and one of our digital signage specialists will reach out to you to discuss your specific needs.